Taste of summer theme means we were to pick a food that reminds us of summer time and I donno about you guys but when I think of Summer and food I think of watermelon! 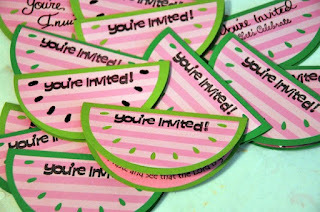 So my project is a large group of watermelon invites that I made for Harmony's dedication (which was entirely watermelon themed). To make my invites I used Just Because Cards and my Gypsy. I welded the watermelon from the top to make a full circle and then cut in green. I folded that in half and made the watermelon. Then I cut the actual watermelon cut in pink stripe paper. I stamped the outside with a few different "you're invited" type stamps (different brands) in black ink. The inside of the cards my husband made on the computer using Power Point and I picked the font. He shaped them with a very faint outline like watermelon shape and I cut them by hand. I used clear photo corners to put the pictures of Harmony in so that people could take them out and display them if they wished. I took the pics of her and made them 4x3. Now hop on over to Court's blog and check out what amazing summer food themed project she's made for you! They sound like simply wonderful invites. You even got hubby in on the action!!!! Unfortunately I don't see a photo of them....yet. I will check back. In the meantime, Thank you for....well everything! It sounds darling. Wish I could see a pic of them. They sound like they came out great. Can't wait to see a picture of them. Looking forward to seeing how they turned out. I would also love to see them. such cute cards. Looks like the pics are now up 'cause I can see them and they are CUUUUTEE! Sooo adorable. I love this idea even for a BBQ. so fun looking. love how its a watermelon but also a invite to share your beautiful daughter.